Students at the University of Toronto say they know one of their fellow classmates took his own life on campus over the weekend. Only the school itself won’t say the word “suicide” out loud. “It’s been U of T’s recent trend to kind of not acknowledge and address the suicides that take place,” said Shobhit Singh, a second-year electrical and computer engineering student. 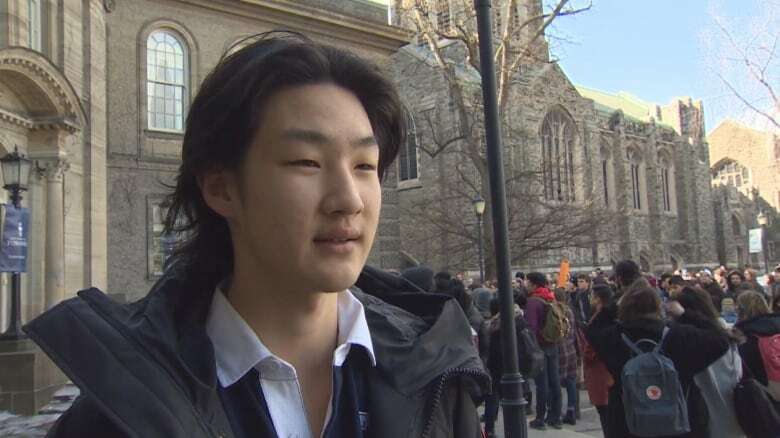 Singh was among dozens of students who stood outside Simcoe Hall, which houses the office of the president, to grieve the death of one of their own and call for action after a string of suicides they say have gone unacknowledged over the past year. “I think this is possibly the third or the fourth time since last year since this sort of incident has happened. And I think we’ve had enough,” said Singh. Inside, dozens more sat on the floor, lining the hallway with signs in hand, hoping their protest would prompt some acknowledgment by the school of the tragedy and the need for urgent change. “We want to send a very clear message that we are hoping for open dialogue between the president and the U of T student body in order to enact sweeping mental health reforms,” said first-year student Oliver Daniel. More health and wellness staff. Increased hours around exam time. Check-in emails from wellness staff for students who stop attending sessions abruptly. Online profiles for staff that list what languages they can offer services in. “Mental health doesn’t work within a limit; it doesn’t work within a set number and automatically you’re fixed,” she said. Toronto police confirm they were called to the university Saturday at 8:40 p.m. ET. Officers on the scene did not deem the death to be suspicious in nature and don’t believe any criminality was involved, Const. Allyson Douglas-Cook told CBC News. 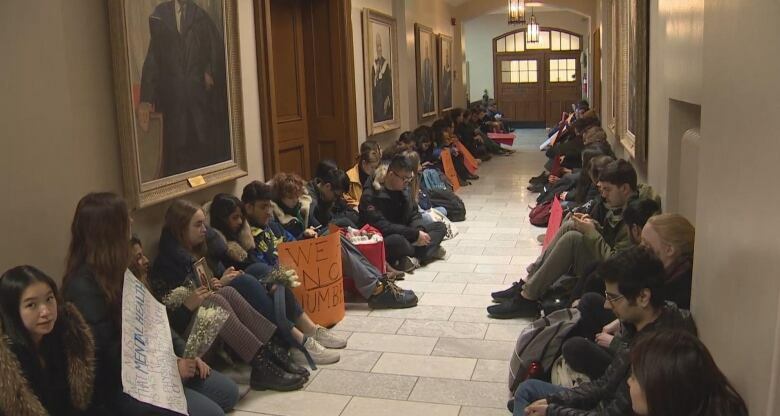 In a tweet Monday, the University of Toronto acknowledged something had happened, citing “the recent incident at the Bahen Centre,” directing students to its campus services and various on- and off-campus crisis lines. But first-year political science student Brian Hao, for one, said the resources available simply aren’t enough. Hao knew the student who died — and knows all too well the toll taken by mental-health issues if left unchecked. He felt compelled to share his story with CBC Toronto in the hope of bringing light to a problem he says too many are silent about. Still, he said, when he arrived at the university, he didn’t know where to turn for help. It wasn’t until he found himself consumed by stress in a moment of crisis, sitting on St. George Street at 2 a.m. in shorts and a hoodie, that he came to know about the resources available. They ask, how could this could happen at U of T? Throughout my undergrad, I: <br><br>- had a medical note get rejected by my prof for not “looking sick” <br>- was almost put on involuntary leave <br>- was told I reached my max number of visits at health and wellness <br><br>That’s how. Beyond that, said students, the wait time for counselling can often be about a month, with the number of appointments capped to about a handful. Janine Robb, the school’s executive director of health and wellness, said she couldn’t confirm either a suicide or a death, but the family involved requested the details be kept private. “Something happened on campus,” she said, adding only it was “tragic incident,” and the university is working to try to fast track access to wellness services for who may have witnessed it or who are affected. 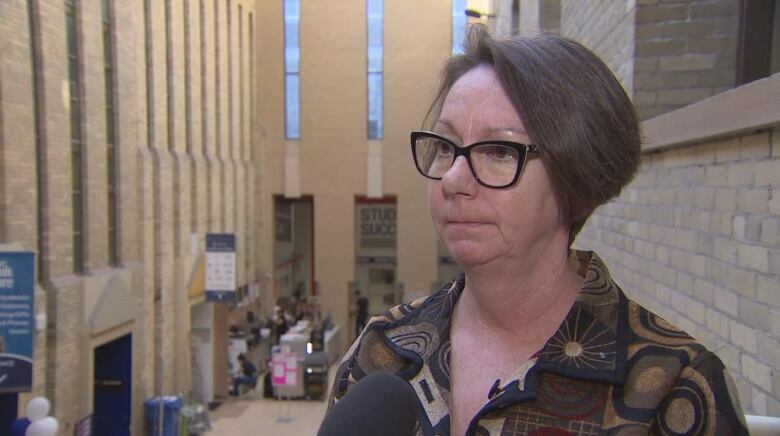 Asked to comment on students’ concerns about a lack of available resources, Robb said she hadn’t heard exactly what the concerns are, but believes the university’s approach needs to be proactive rather than reactive. “We can continue to throw counsellors, psychiatrists, medical doctors at this issue, and it’s never going to be enough,” she said. But Hao believes until the problem of student suicides is brought out into the open, it will only grow. Despite talking to the student who took his life only a few days earlier, Hao said he simply couldn’t tell he was struggling. “This subject is so not talked about, so taboo, that it really could be somebody living down the hall.